…and it was covered in the 5 Hour Energy Drink commercial! I was googling pictures of Louis CK because I’m going to start writing recaps of his show…and well…I stumbled across this picture on Liezl Estipona’s website! Recognize that arm and that Picasso tattoo? Liezl takes a lot of great pictures of the LA comedy scene. Check out more of her work on her site! Posted on July 31, 2011, in More Misadventures! and tagged Comedian, comedy, doug benson, liezl estipona, louis ck, mike bobbitt, off the mike, ucb. Bookmark the permalink. 2 Comments. I know it’s a long shot, but I hope Louis CK gets an Emmy. Can’t believe you were able to keep your hands off him. And speaking of your arm, I see that Meet Monica Velour http://amzn.com/B0051ZIXJO is out on 8/16. Is that a bottle in your lap or are you just happy to be there? 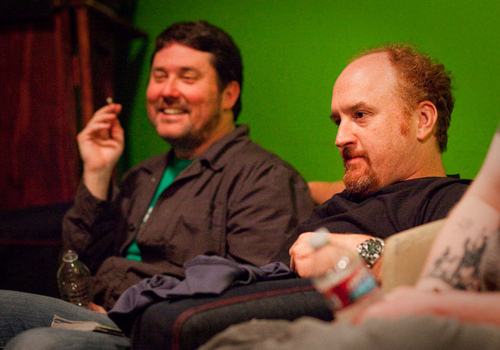 Is Doug Benson smoking a doobie?